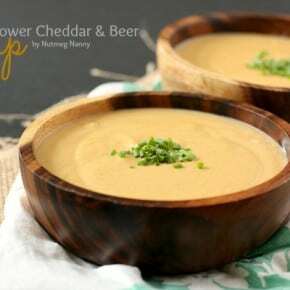 This super creamy cauliflower cheddar beer soup is packed full of flavor and is perfect for cool weather. In an hour you can go from hungry to full. Last Friday I had the pleasure of having lunch with two fabulous bloggers, Gina and Winnie. I always enjoy going out to lunch with them and we usually end up chatting for hours. We really need to plan a dinner together so we can chat the night away. While at lunch we all had the most delicious soup. I decided this weekend I had to recreate it’s deliciousness. Off to the store I went to gather the ingredients! Back to the soup. 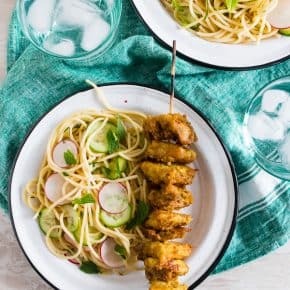 It’s creamy, savory and packed full of flavor. I even added a little bit of jalapeño to add a bite of spice. It was the perfect addition to this cold winter (please spring come soon!) day. Cut off bottom of the cauliflower (the green part), cut the head into 4 pieces, cut out the center core and cut off just the florets. 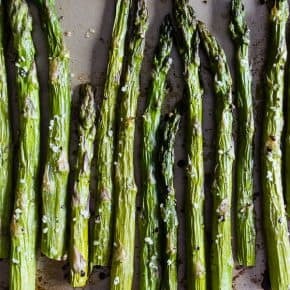 Lay out onto silpat lined rimmed baking sheet, drizzle with 1 tablespoon olive oil, sprinkle with a little kosher salt and fresh ground pepper. Bake for 10 minutes, stir/flip the cauliflower florets and continue baking for another 10 - 15 minutes until the cauliflower is soft and golden brown. Careful not to let the cauliflower burn. Once cooked set aside until ready to use. In a large soup pot add olive oil and diced bacon. Cook over medium heat until the bacon is just starting to brown. Add in onion, carrots and jalapeño. Continue cooking until the vegetables are started to soften. Add in beer, chicken stock, bay leaf, cayenne pepper, salt, roasted cauliflower and dijon mustard. Cook for about 10 minutes until flavors are combined and all vegetables are soft. Add mixture to a Vitamix (or other high powered blender) and puree starting on speed 1 and slowly going up to speed 10. Blend on speed 10 for about 2 minutes until completely smooth. 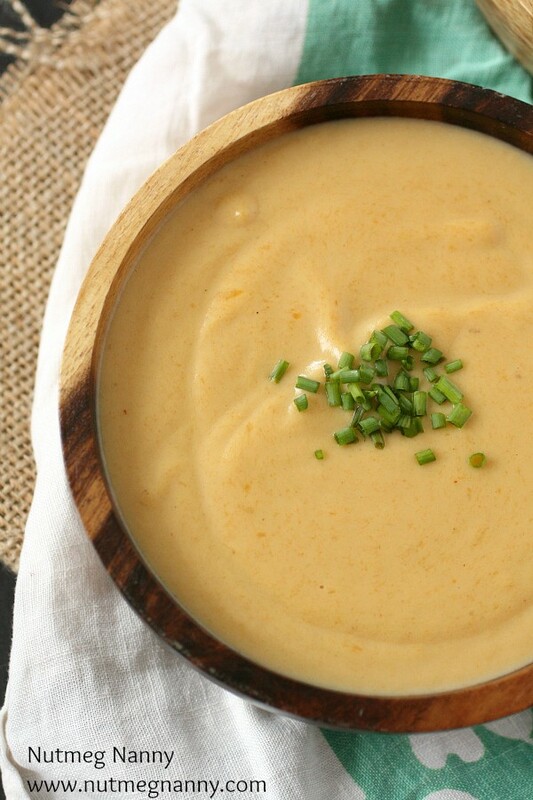 Add pureed soup back to the pot and cook over low heat while you prepare the cheddar cheese. 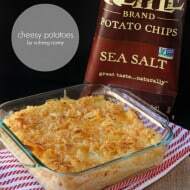 In a bowl add shredded cheddar cheese and toss with 2 tablespoons cornstarch. Add cheese to the soup a handful at a time. Stirring the whole time so the soup does not burn and the cheese incorporates smoothly. Continue until all the cheese has been added and the soup is smooth. Serve hot with diced chives if desired. * It would also be great with little pieces of bacon on top but I forgot to make more. This looks so good!! 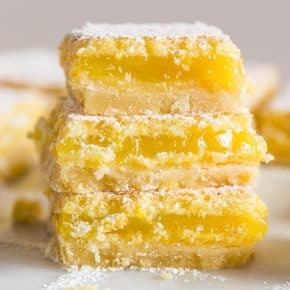 I saw your photo on Instagram last night and was hoping you would post the recipe soon. I have a huge head of cauliflower in the fridge just waiting for me to do something with it. I guess this is it! I hope you like the recipe! It’s a perfect use for that head of cauliflower! Hooray! I hope you like it 🙂 I think the Newcastle had a stronger beer taste than the soup at Babycakes but I liked it. I was so surprised how well cauliflower went with this soup! It made it so creamy! This is definitely a way that I could get into eating cauliflower. I just got a Vitamix and this recipe looks amazing. Win/win! This looks amazing! I am printing the recipe now! Can’t wait to try it. Yes, please! This sounds lovely! Thank you! I was so please at how well the cauliflower worked in the soup! This looks incredibly creamy and delicious. 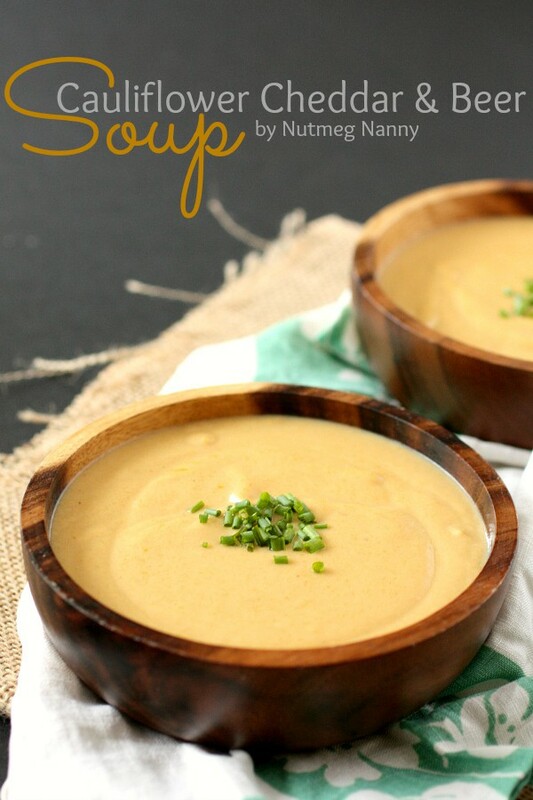 I love comforting soups like this…they’re perfect for this chilly weather! I am loving the color of this – the flavors and those wooden bowls! And how fun that you had a blogger meetup. Chatting for hours is a great thing. The Perrier water and moving at a snails pace…omg you must live in my town 🙂 I can totally relate! Aww how fun!! I so wish I lived closer to you guys! Blogger lunches/coffee dates/dinners are the best! 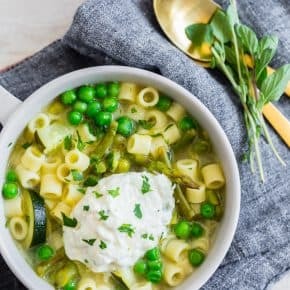 This soup looks totally good for the soul! I wish you lived closer too! We should get together one day while I’m in the city! Clearly this is how you eat your veggies…with beer and cheese. I dare say this looks even better than the soup we had. Can’t wait to try it (or to see you again)! Awwww you’re too sweet 🙂 I can’t wait for lunch again! Me too! I’m ready to open the windows and spend more time outside! Hurry up spring! I’m pretty speechless here… this is absolutely drool worthy!!! WOW! This looks divine. And how fun you got to hangout with fellow food bloggers! You crack me up about the college students in the grocery store. I’m sure she was probably rail thin, too since all she was consuming was bubbly water! This looks absolutely divine. I totally avoid grocery stores on the weekends at all costs! People are super slow and so rude. I can’t imagine what it would be like to have a bunch of sweat pant-clad zombie-like hungover college students roaming around the store aimlessly. That is exactly what it is like! It really is a pain living in a town where they are 4 colleges….ugh! This is just unreal!! It looks as beautiful as can be! Thank you Sally! I got the bowls at Home Goods for only $3 a piece!!! Hahaha thanks Shanna! I got the bowls at Home Goods for only $3 a piece! Boozy, cheesy, bacon-y and good for you cauliflower? Definitely a soup I can easily love! Plus your pictures make me feel like I can reach in and really eat it. If only I had a spoon. It’s a perfect soup for this cold weather we are having. I hope it warms up soon!!!!! This looks so good! I have a hard time getting my husband to eat cauliflower, and I love it. Maybe with the addition of beer, he won’t be able to pass it up! 🙂 I too hate going to the store on Sundays. Saturdays are also bad for us. I need to give cauliflower another try. I think if I roasted it and made this soup I could be converted. Beautiful photos (as always!) too. This sounds so incredible. The weather here is getting continually colder and colder, so I am most definitely going to keep this in mind for future making. I hope you like it! It’s perfect for cold evenings! Booze, cheese and veggies? It’s all the important food groups in one glorious, cozy soup! Wow, this soup looks absolutely amazing. Can you tell me if it has much of a beer flavor. We are just know into the taste of beer, so I’m leery about trying this one. If it does taste like beer, could I substitute more chicken broth and have it taste yummy? Thanks. Hi Cynthia! 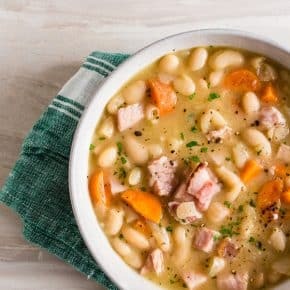 The soup does have a bit of beer flavor and if your not a fan I think stock would work just fine. 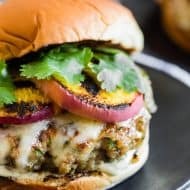 You would still gets lots of yummy flavor from the cauliflower and cheese. Hi Jen! The soup definitely has a beer taste but it doesn’t usually come out bitter. If you would like to mellow out the taste I would recommend adding in more chicken stock and cooking it down to make it lovely and thick again. I’m super sorry you didn’t like the way it turned out. Do you mind if I ask what beer you used? Thanks! This was so so good!!!! I’m a veggo so I left out the bacon and used vegetable stock. I added some smoked paprika and a roasted red pepper (because I had it). Will defiantly make again! I made some soft pretzels to use for dippers — amazing! Thank you so much for the recipe. Hi Molly! Thank you so much for coming back and letting me know you liked the recipe! I love the idea of adding smoked paprika (its my favorite spice!) and roasted red pepper. Plus those pretzel dippers sound amazing! 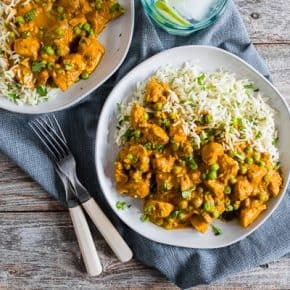 Thanks for this delicious recipe. 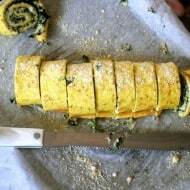 I just made a batch of it–so easy and so delicious. What a great way to get good for you veggies in your diet without even really knowing it. Do you take the bay leaf out before putting it in the blender? FYI you have the bay leaf listed twice on the ingredients and in the directions.. Does the alcohol cook off? I have a 3-year old who eats what we eat. Wondering if this is inappropriate for kids. Not worried about the beer flavor, just the alcohol. Thanks. 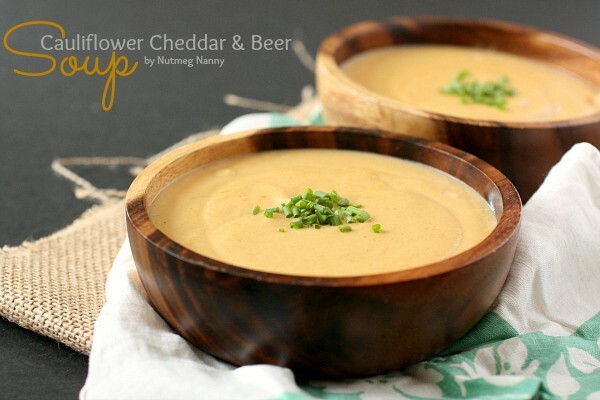 Pingback: 20 Blended Soups + a Vitamix Giveaway! - Healthy. Delicious.